IDF force securing Jewish worshipers at Joseph's Tomb opens fire at a Palestinian Arab vehicle that accelerated towards it. An IDF force that was securing the entrance of Jewish worshipers to Joseph's Tomb in Shechem (Nablus) overnight Monday opened fire at a Palestinian Arab vehicle that accelerated towards it, the IDF said. There were no injuries among the soldiers. Violent disturbances broke out in the area as the prayers were ongoing. Palestinian Arab media reported that there several Arabs were injured in the disturbance, including one who sustained moderate to serious injuries. The IDF said the details of the incident are under investigation. 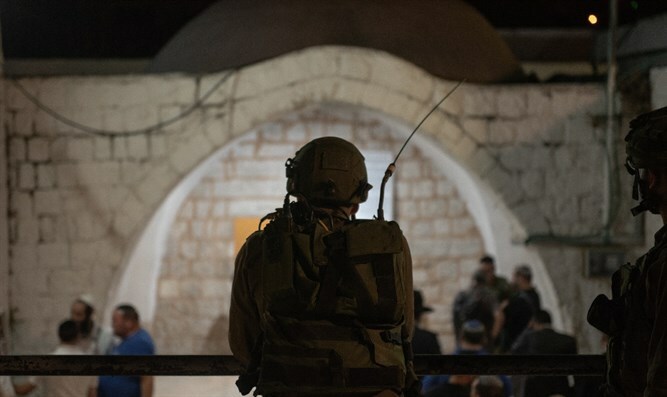 Earlier this year, a mobile operated explosive device was found near the Joseph’s Tomb compound as IDF soldiers were securing a prayer service at the site. A bomb squad carried out a controlled explosion of the device. As forces entered and the buses left the tomb, rocks were thrown at them. One bus was slightly damaged, but no one was hurt. One Arab was arrested on suspicion of disturbing the peace. Palestinian Arabs regularly disturb the peace near Joseph's Tomb and vandalize the site.